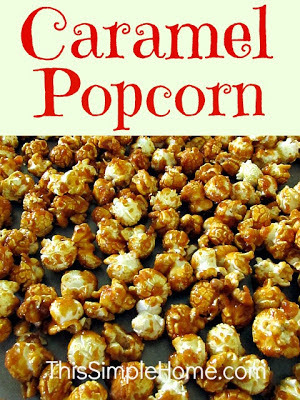 When I first made the caramel corn myself, I made a half batch (3 quarts) which is the amount of popcorn my family would usually eat in a sitting: one giant bowl of popcorn. Since it was covered in sweet goodness, we didn't eat as much at one time (my kids are little), but if it weren't for a bit of self-control it would have been devoured rather quickly. This recipe for caramel popcorn stores very well in an airtight container, so next time I will make a full batch when we have friends visit for a football game or movie. That will be enough for the party and more for our family to snack upon during the week. Before you begin, make sure you have a candy thermometer! Place popcorn in a large roasting pan. In 2 1/2 quart saucepan, combine brown sugar, corn syrup, butter, cream of tartar and salt. Bring mixture to boil, stirring, over medium-high heat. Stirring constantly, boil rapidly to hard ball stage, 260° (about 5 minutes). Remove from heat. Stir in baking soda quickly but thoroughly. Pour all of mixture over popcorn in large roasting. Stir gently until all kernels are coated. Bake at 200° 1 hour, stirring 2 or 3 times during baking. Turn out at once on wax paper; spread apart and allow to cool completely. Break apart if needed. Store in an air-tight container. Makes 6 quarts. ~ Use CAUTION! The mixture is HOT! ~ The photo above was taken when the popcorn was cooling on the wax paper. ~ I prefer mushroom popcorn. There is almost no hull. ~ This may sound a bit complicated to make, but it is easy as long as you have your candy thermometer. ~ To be honest, I put in the baking soda too early, but it still tasted great! If you like popcorn treats, consider making popcorn balls! This sounds delicious - not that I need another test of self-control!